Tell the USDA Growing in Factory Farm Fish Waste/Conventional Soybean Slurry, under Artificial Lighting, is not Organic! A few years ago, the organic community was shocked to find out that the USDA’s National Organic Program was quietly allowing the certification of hydroponic operations despite the law! Organic regulations clearly state that nurturing the fertility of the soil is an integral part of organic management. Unlabeled, it is impossible for organic consumers to tell what fruits and vegetables are grown in nutrient-rich soil (impacting flavor and our health) or grown in a liquid fertilizer solution, in industrial conditions, and imported from countries like Canada, Mexico and Holland — where it cannot legally be labeled as “organic”! 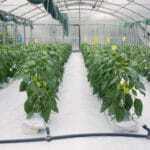 Much of the hydroponic or “container” grown fruits and vegetables are produced inside sealed warehouse-sized buildings under artificial lighting — with liquid fertilizer that could come from a myriad of different waste products or even highly processed GMO soybeans. Currently more than 100 facilities are supplying U.S. consumers with “organic” hydroponic fruits and vegetables, including the giant berry producer Driscoll’s. The National Organic Standards Board (NOSB) will be voting in mid-November on whether or not to allow hydroponic/container operations to be certified organic (at their semi-annual meeting in St. Louis, Missouri). We will hand deliver your message, along with those of other farmers and eaters, to NOSB members at their meeting! 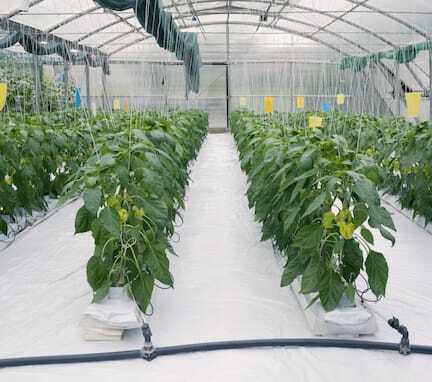 It is incumbent upon the current NOSB and USDA officials to respect past NOSB recommendations banning hydroponics — keeping USDA standards consistent with international rules that prohibit soil-less vegetable production as certified organic. 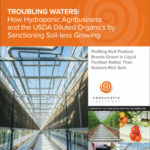 You can make a positive impact today when you print, sign, and mail back the proxy asking the NOSB to stop certifying hydroponic and aquaponic operations. For more background information please see the news release and other resources on this issue published by The Cornucopia Institute.